The Colour Closet is Sara's first interactive book for the iPad. Published by the innovative team at Twistframe, this book lets the reader colour the story in whatever way tickles their funny bone. 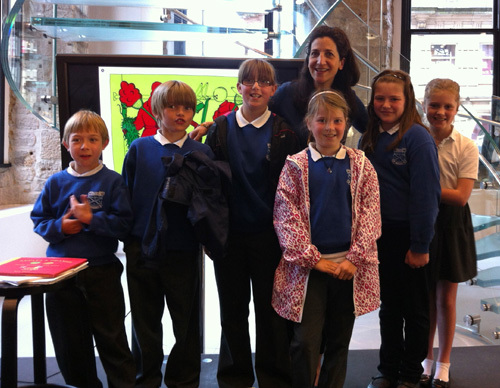 Chryston Primary's P5 class at Colour Closet launch party at The Apple Store in Glasgow. Open the doors to The Colour Closet and discover a world where an orange skeleton can wear turquoise boots and mustard mice like to spin red hangers. The fun starts simply, but as this quietly riotous story unfolds, more colours join the closet and a celebration of nonsense erupts at your fingertips. You are the artist, tapping the screen to colour the picture in endless exciting combinations. This delightful, innovative tale takes colouring books to another dimension. Lilac, violet, lime and mustard. Cerulean, plum and custard. Who knew there were so many wonderful colours? "I found this book yesterday, searching for books to help children learn their colors. Boy, was I lucky. This is a wonderful use of this technology for children. Though I've only just begun to explore the possibilities, I do know that it captures you from the start." "This is not your standard "learn your colors" picture book. I knew that there would be little standard about it as soon as I saw who the author is: Sara Pinto. She has written "The Alphabet Room" and "The Number Garden", among others. Truly wonderful books, full of anticipation and wonder. "The Color Closet" takes the idea of each turn of the page building on the previous one step further. The reader can manipulate the colors. This builds throughout the book. I believe there's even more to it than that. You and your child may begin to notice a pattern of how the colors evolve at the turn of each page. For me, personally, it was hard to put down! Wait until you get to the last few pages. The possibilities seem endless.